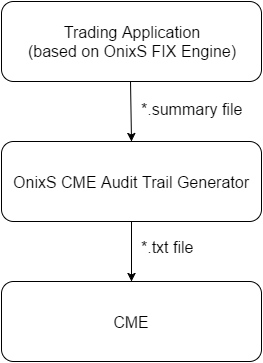 OnixS directConnect: CME Audit Trail Generator is a software component (library) that provides the functionality to generate from the FIX message log the electronic audit trail in accordance with CME Globex Front-End Audit Trail Requirements. High-level and easy-to-use API that enables quick integration of CME Audit Trail Generator without deep involvement in the CME Globex Front-End Audit Trail requirements. 1-Tier / N-Tier architecture support. Fully complies with CME Globex Front-End Audit Trail Requirements.